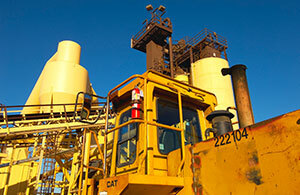 Mining of Construction Aggregates at United Rock Products in the San Gabriel Valley has taken place since 1916. Originally started by United Rock Products sister company, Blue Diamond Materials, our top-rated 300-acre site is located in Irwindale, California, just 25 miles east of Los Angeles. Virgin aggregate material is processed into sand and gravel through cutting-edge crushing and screening operations. Our automated state-of-the-art truck load-out system can load, weigh, and ticket in as little as one minute. Whether making custom blends or creating new products, United Rock Products has the knowledge and commitment to meet even the most specialized customer needs. If you are interested in working for United Rock Products or any of the Sully-Miller Contracting Companies, click on See Available Positions Here. Primarily consisting of crushed rock, sand and gravel, United Rock Products manufactures most products that specifically cater to the construction, ready mix, and asphalt industries. However, we are able to manufacture specialty products based on the client’s request. United Rock Products© 2013. All Rights Reserved. An Enthusiast Website Solution.